A compendium of quilting tips and tricks from today’s best quiltmakers, this little volume is worth its weight in gold! Learn how to ensure exact seams. Improve the quality and accuracy of your piecing. Find out how to smooth out your machine quilting, with no puckers. See how prizewinning appliqué artists achieve those perfect points and curves. And while you’re along for the ride, learn how to make the most of standard tools and add a few new twists to your quilting tool box. Ann Hazelwood is known as a collector of great information. A longtime resident of St. Charles, Missouri, and an authority on all it has to offer, Ann is a certified AQS quilt appraiser and the owner of Patches Etc. Quilt Shop and Patches Etc. Button Shoppe, both in historic St. Charles. 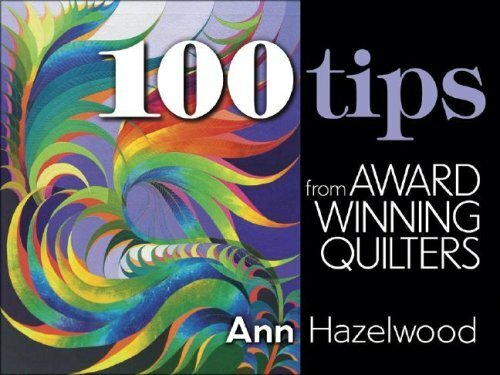 Other AQS books by Ann include A Thought-a-Day Calendar for Today s Quilter and 100 Things You Need to Know If You Own a Quilt: A Quilt Owner’s Manual.